Leprosy is a chronic infectious disease caused by Mycobacterium leprae, an acid-fast, rod-shaped bacillus. The disease mainly affects the skin, the peripheral nerves, mucosa of the upper respiratory tract and also the eyes. It may also involve the throat and testicles. Leprosy is also known as Hansen’s disease. Leprosy has existed for centuries and has been regarded as a contagious, mutilating and incurable disease. This disease is common in parts of tropical and subtropical Asia, Africa, Central and South America, some Pacific countries, and in parts of the USA. In Australia, leprosy is now rare. With the introduction of multi-drug therapy in the early 1980s, the disease is now curable. Leprosy is characterized by skin lesions. Other effects of leprosy are due to its impact on the nervous systems of the body. 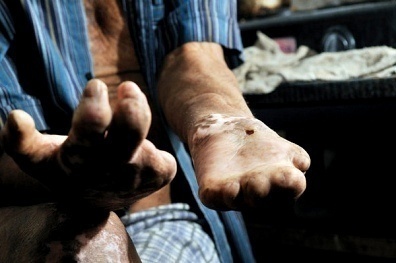 Leprosy does not affect the central nervous system but it can affect the sensory nerves where no pain can be felt, peripheral nerves causing blindness, motor nerve damage leading to paralysis, and autonomic nerves causing hair loss and dry/cracked skin. The exact mechanism of transmission of leprosy is not known. Until recently, the most widely held belief was that the disease was transmitted by contact between cases of leprosy and healthy persons. Researchers believe that M. leprae is usually spread from person to person in respiratory droplets. When a person becomes infected with Mycobacterium leprae, the bacteria begin to multiply within the body; symptoms often begin after three to five years. Even in severe cases, damage is limited and generally affects feet, hands, and peripheral nerves. Close contacts with patients with untreated, active, predominantly multibacillary disease, and persons living in countries with highly endemic disease are risk factors for leprosy. Risk factors are not necessarily a direct cause of leprosy, but they however, increase the chances of someone contracting the disease. Risk factors include international travel especially to developing countries, Asia, Africa, Central and South America and India. Humans are the only source of infection where the disease is spread through droplet infection. A large number of bacteria are shed in the nasal secretions and from the superficial lesions and nasal secretions of the multibacillary type of leprosy. Children are at greater risk of contracting leprosy than adults. What Causes a Tingling Sensation in the Left Arm?